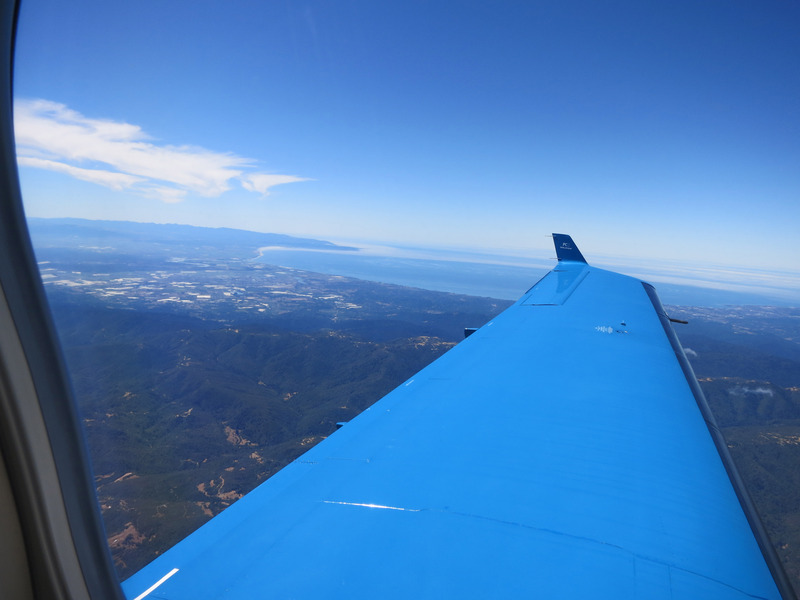 This was going to be a review of Surf Air, but after my first two flights I'm just going to go ahead and turn this into a love letter. Surf Air is truly wonderful, a gift to mankind, and I love them for existing. 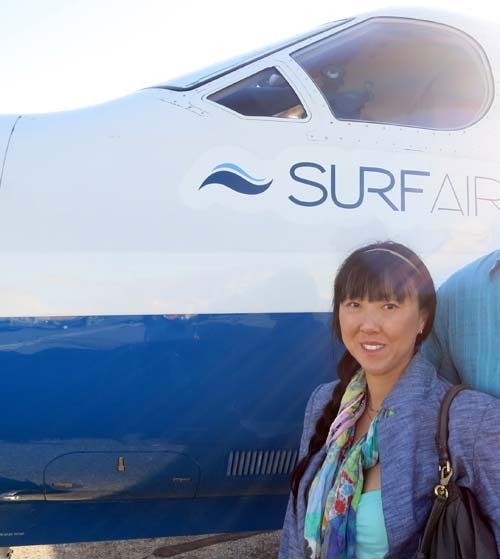 Surf Air gets everything about their customers' experience flawlessly "right". Below I'll try to explain why they make me so happy. 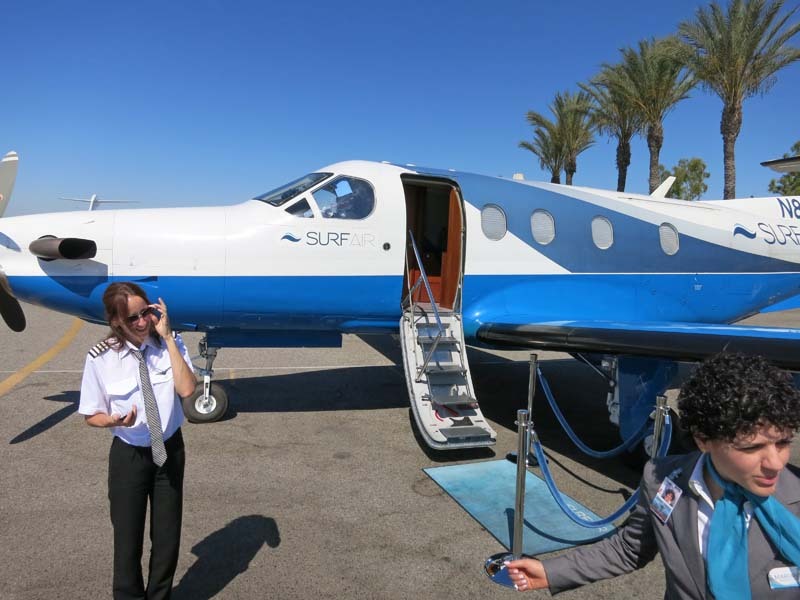 And just in case you are wondering, I do not have any affiliation with Surf Air of any kind (other than a massively satisfied customer) and I own my own company and you can check my identity out here, here, and here. And if you still have questions, just email me at the email address at the top of this webpage and I'll answer any questions I can for you. - Save Time - If you pull off the highway exit at the airport 16 minutes before the flight departs, you will make your flight. That includes: parking, returning your rental car, passing security. - No dumb rules, no useless security theater - you keep your shoes on, you don't put fluids in a quart bag, no X-Rays. None of those things actually make airlines safer anyway. 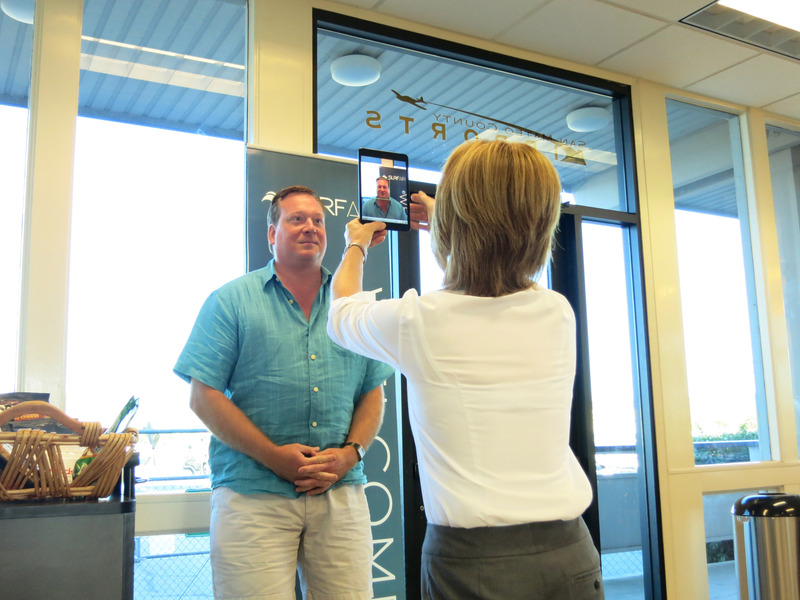 - You are treated with respect - Surf Air employees greet you by name with a smile BEFORE you show them an ID. 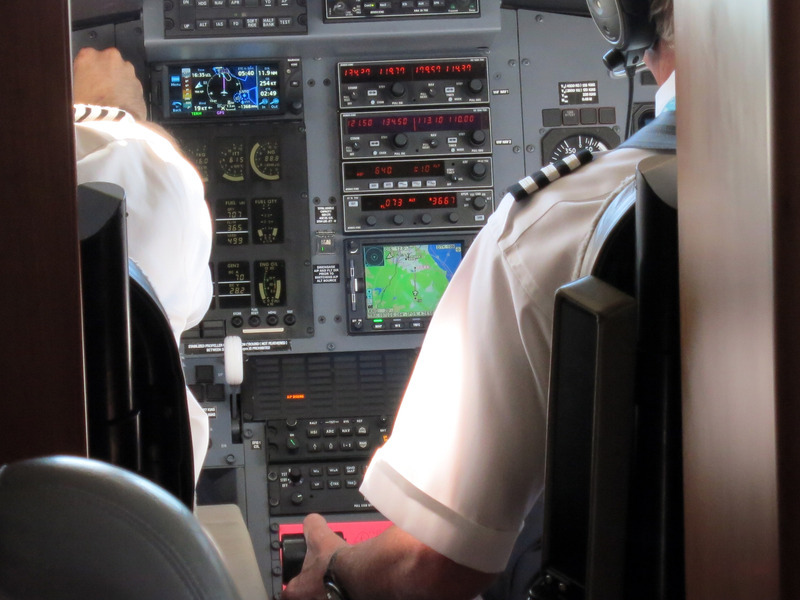 The pilots chat with you between flights. - Zero parking fees - you park your car for free at the private terminals. And I mean "by the front door", handicap parking isn't any closer to the airplane. - No "nickle and dime" fees - Feel free to book your flight 3 minutes in advance of departure, it's FREE. Changing your flight is FREE. No fake "$50 to change this ticket" BS. 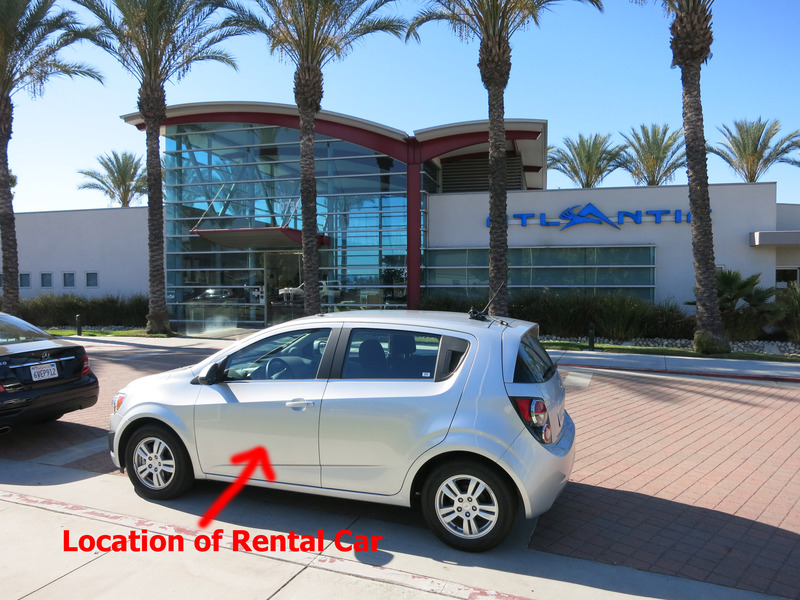 - Faster Rental Car - as you step off the plane a Surf Air employee presses the rental car key into your hand and you step into the rental car and zoom away. - Free Guests - Take 1 guest along with you on every flight for free. - "All You Can Eat Subscription" - You pay a monthly subscription (about $1,500/month) and you can fly as much as you want, although honestly this isn't why I like Surf Air, I would rather they charge for every flight. - Did I mention it saves time? 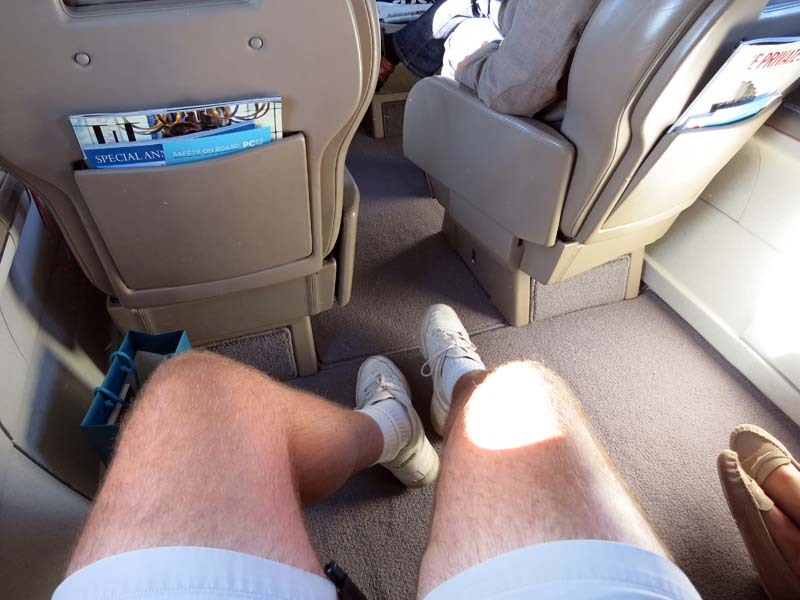 - On the airplane the bathroom is "emergency only", and may not even work for 6 foot tall passengers. - Cost (about $1,500/month subscription) - so if you don't fly a couple times a month it may not be worth it. I Hate United Airlines: For several years now, I have been unhappy with the experience of flying on United (and the others), and I wish to sever our relationship. I no longer want to give my money to a company and a system I loathe with every fiber of my body. It is their whole attitude - treating me like a criminal actually taking an X-Ray of my body before EVERY FLIGHT (as if I became a terrorist in the 36 hours since my last flight), their attitude when they take my water away, their attitude as they charge me a fee to change my father's flight when UNITED CANCELLED THE ORIGINAL FLIGHT. I hate United and the airports because they are rude and mean and the employees that still work there are either bad people with black and withered hearts, or (as many have told me personally) are older flight attendants and airline employees trying desperately to survive vindictive management and layoffs until they get their pension. Furthermore, United Airlines Breaks Guitars. I say this even though I'm a United Premier member and continue to reluctantly use their service to go places that Surf Air will not take me. 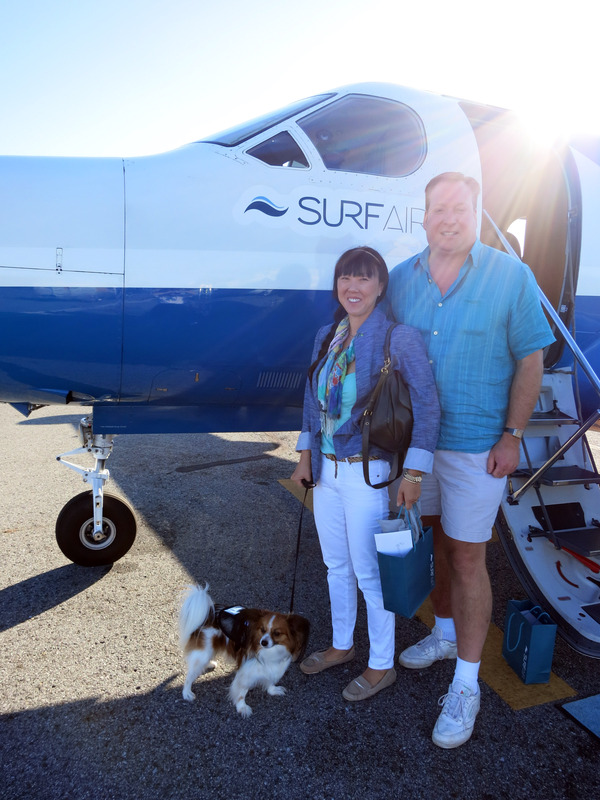 My Declaration of Love for Surf Air: My new favorite airline is Surf Air. Heck, they are my new favorite service business in my life. They get everything profoundly "right". And I mean that in a big way. I *WANT* to give these people more money, they provide a fabulous service for very little money. They treat me kindly, they speak to me politely, they do not take my pocket knife or water away from me like I'm a child. They save me time. They make my life simple. I love Surf Air. I am loyal to Surf Air. 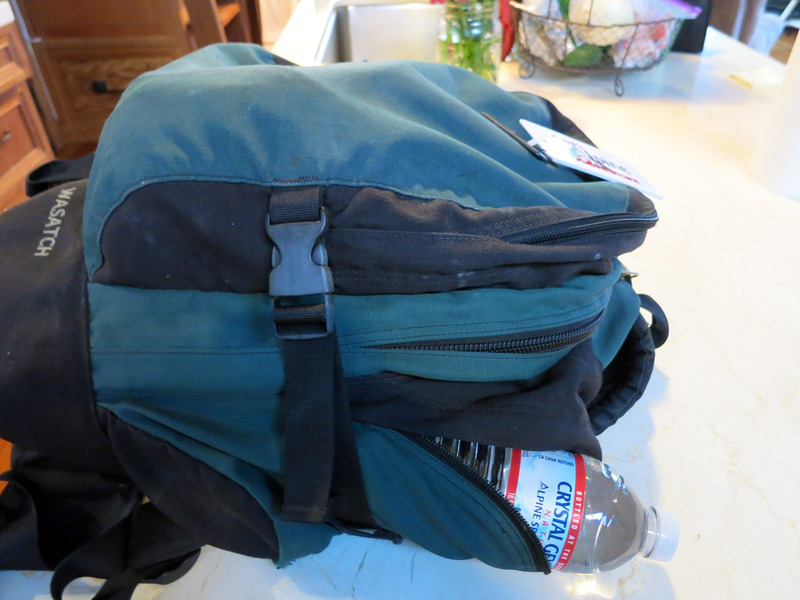 On to pictures and details: Below is my bag before my first Surf Air flight. In the old days, before the 2006 liquid ban, I always brought large bottles of water onto planes to fight dehydration. The TSA (my hated nemesis) has been stealing my water since 2006. And it isn't just that they take my water, they treat me like a criminal and act as if I'm trying to terrorize America because I'm thirsty. Below shows my water I'm going to bring onto the Surf Air flight. As expected, this went very well. 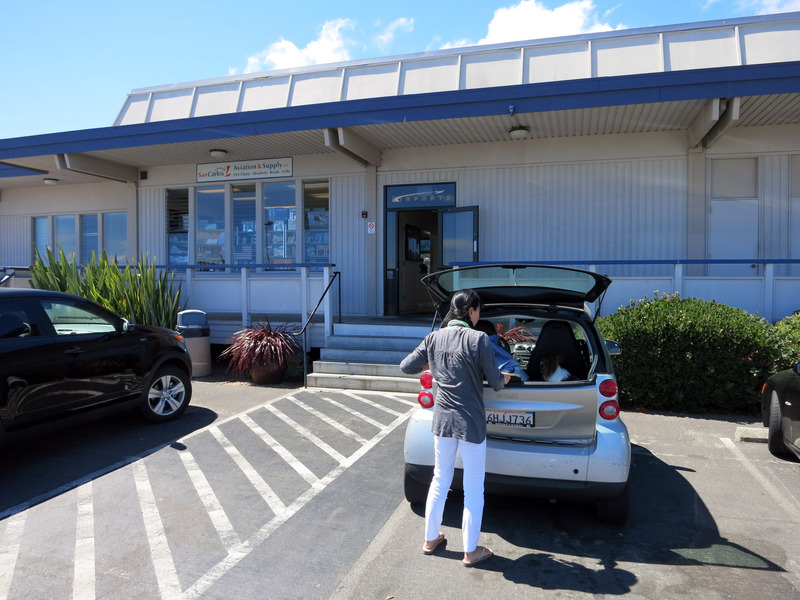 Here we are in San Carlos Airport, parking FOR FREE by the FRONT DOOR OF THE TERMINAL. It's like we have just stepped through a wormhole into an alternate reality. We took 12 steps in past the front door, and this is what we see. The blue plane you can see faintly behind the glass door is our plane. 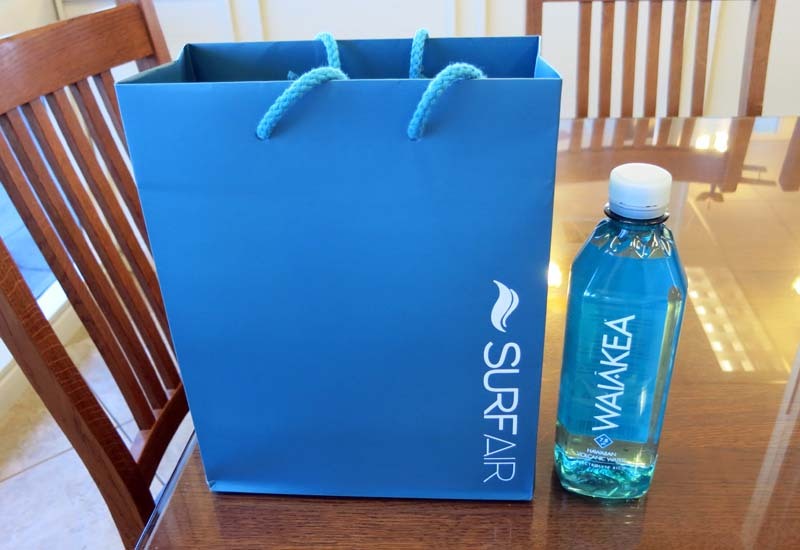 Welcome to Surf Air. 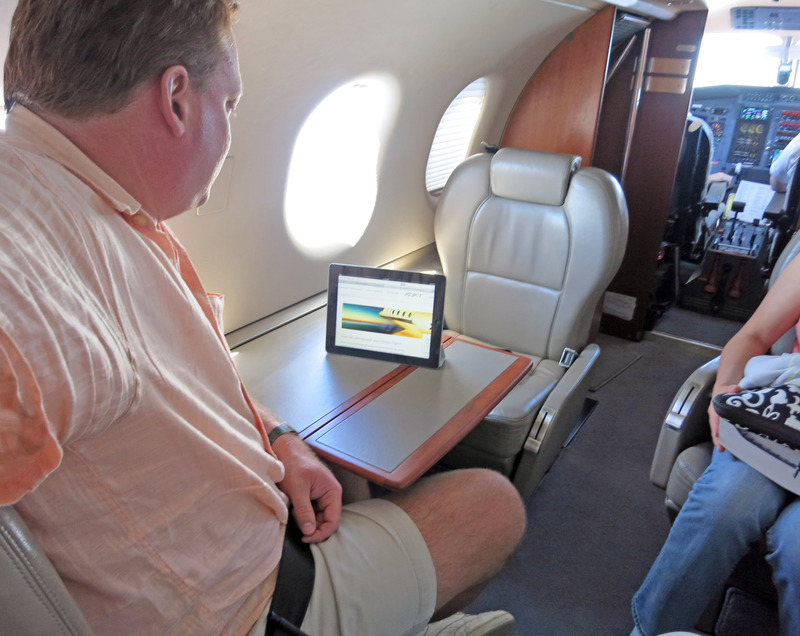 Surf Air uses iPads, a sign of their excellent taste. 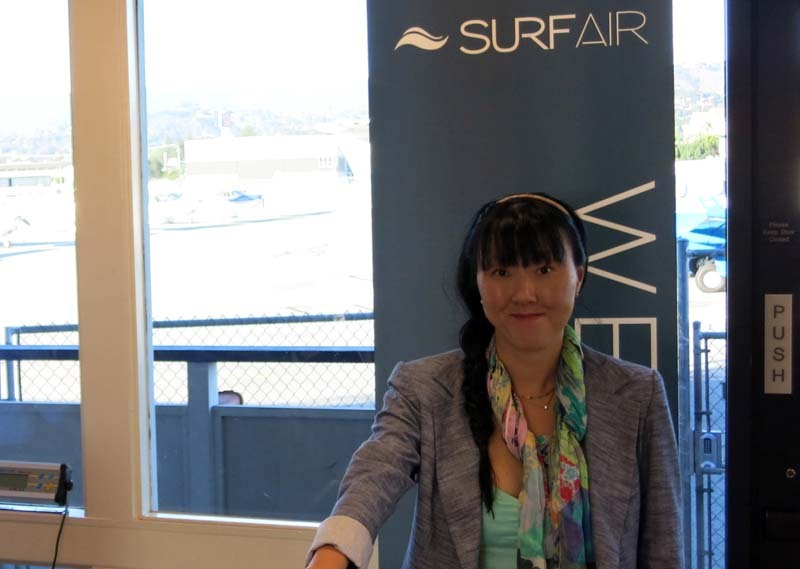 When you check into Surf Air for the first time, they check your ID, and then take your picture. This is so that for the rest of time, they can greet you by name as you walk into the terminal without checking your ID first. Katherine in front of the Surf Air sign. 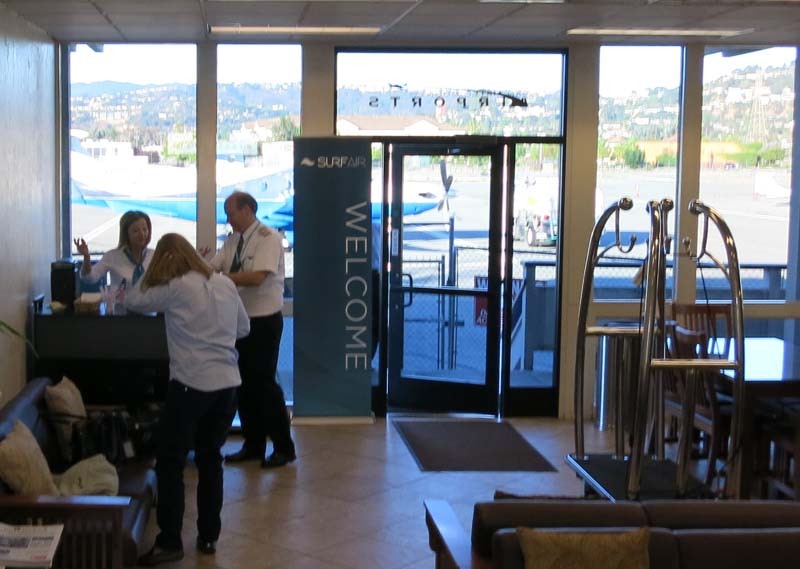 In the San Carlos airport there is a nice little coffee shop called the Sky Kitchen Cafe which gets pretty good Yelp reviews. 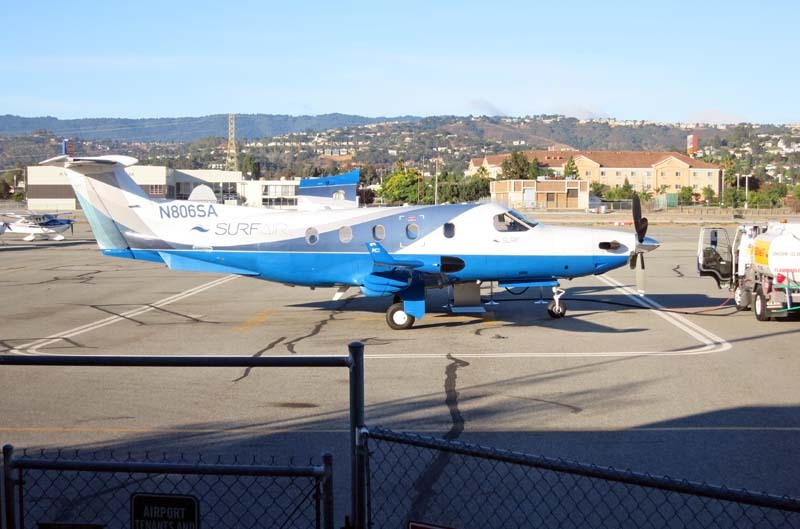 This is our plane, a Pilatus PC-12. I'm not a pilot or a plane enthusiast, but my professional pilot friend could not say enough good things about this plane. It is fuel efficient but fast. It is fast, but capable of landing at slower speeds for safety. It is roomy. It has a good "glide ratio" in case the engine has problems and you need to land. 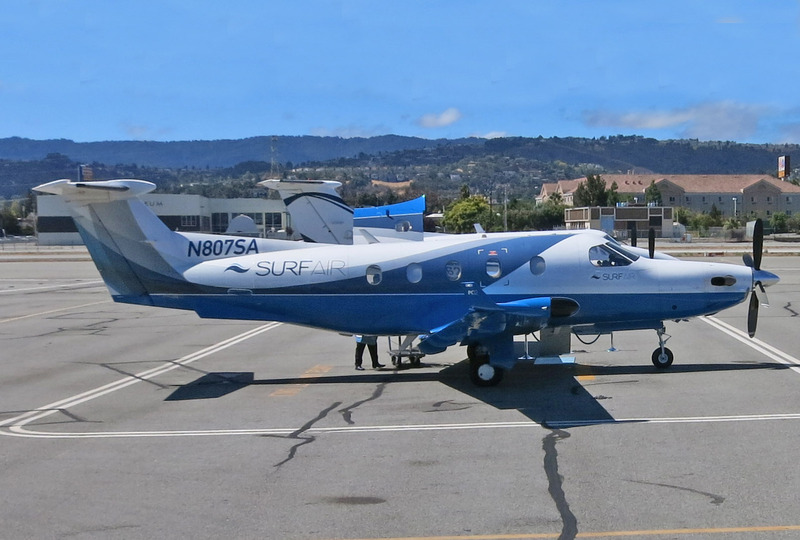 The more I find out about Surf Air, the more I feel the owners are intelligent people with good taste. 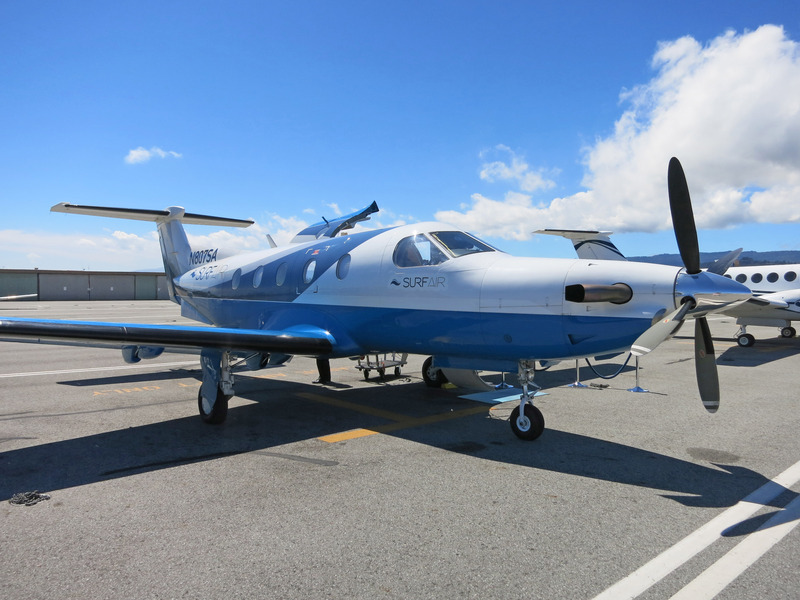 A closer up view of the Pilatus PC-12. 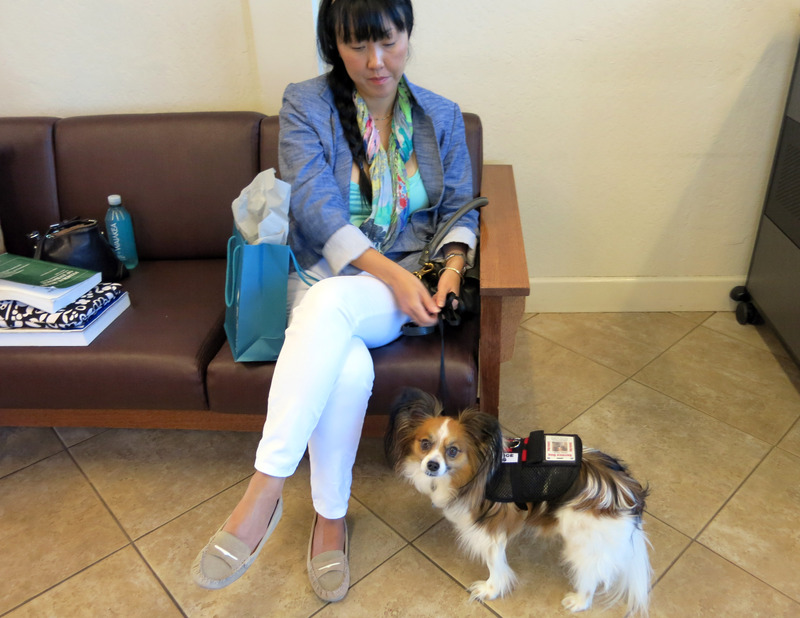 Katherine and Chou Chou awaiting their first flight. 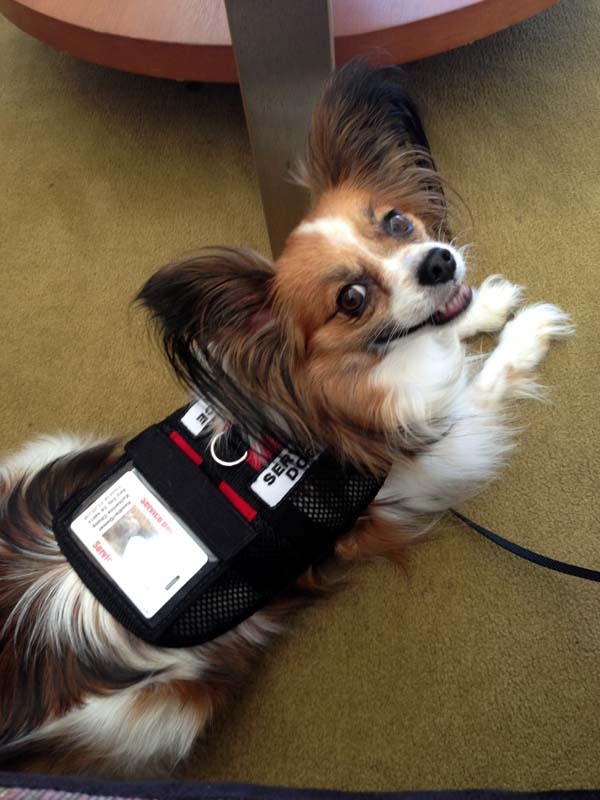 Chou Chou is a service dog, which explains his little red backpack and id tag. And here we go! We walk out with the pilot in a group (there are 4 of us flying this day, the airplane seats up to 6 customers and 2 pilots). Our pilots on the way out were John and Jason I think. And here we are before boarding, that's Katherine on the left and me on the right. Same picture, just close up of Katherine. 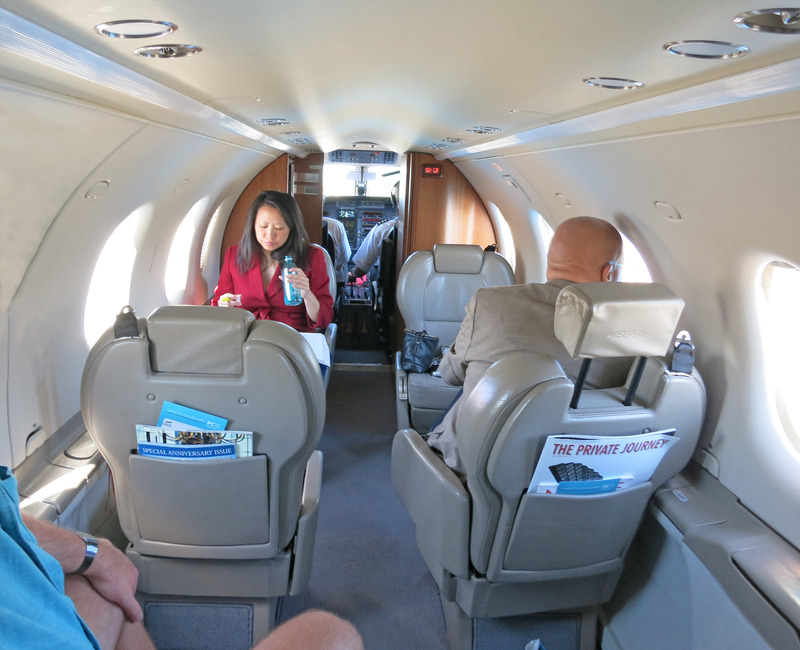 Below is the interior of the Pilatus PC-12. 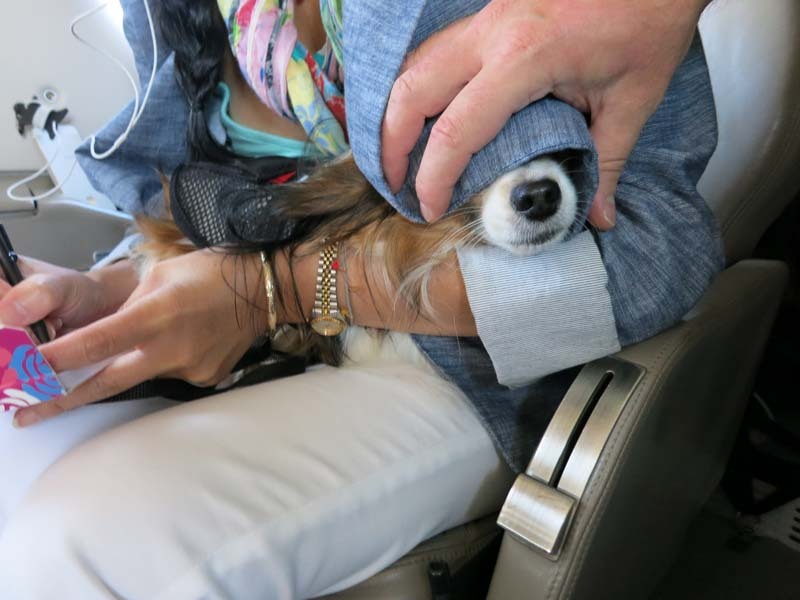 This is a picture from our flight. You can see the two pilots in front about to take off. 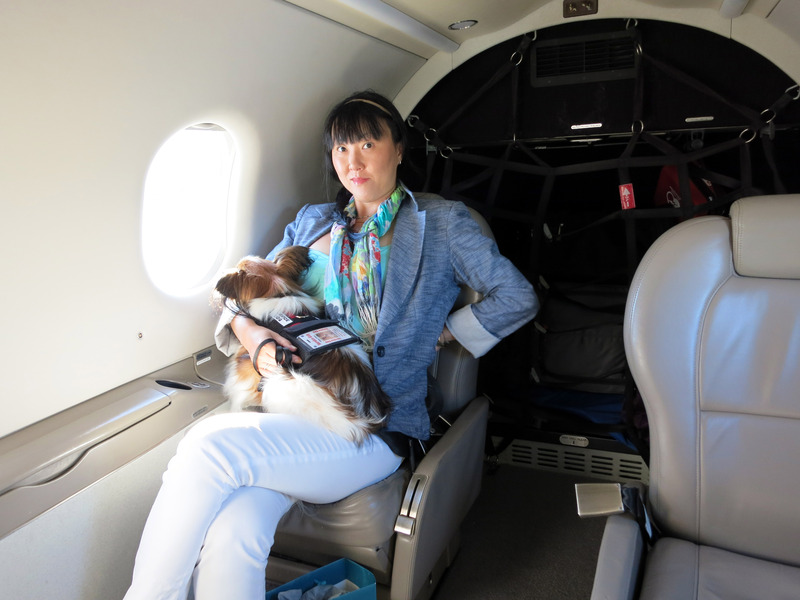 Here is Katherine in her seat holding Chou Chou. And we take off from San Carlos Airport. 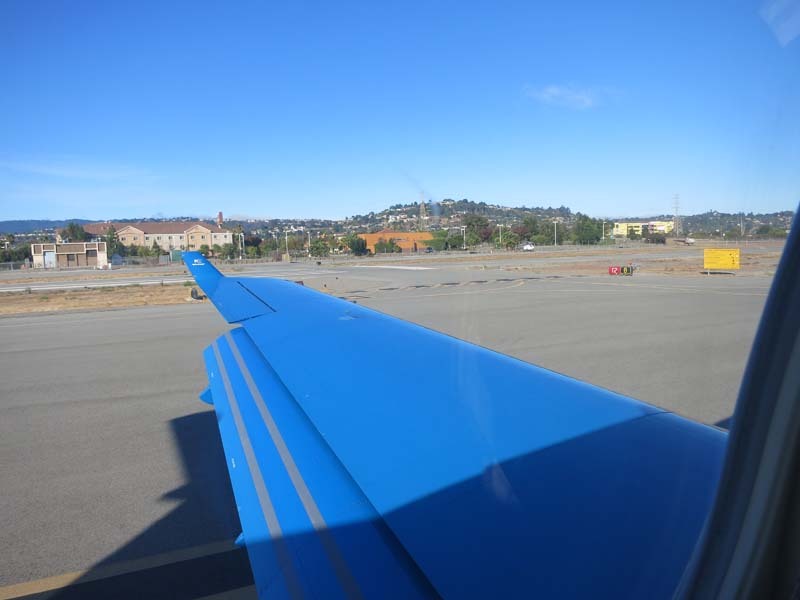 A close up of the San Carlos tower behind the winglet of the Pilatus PC 12. 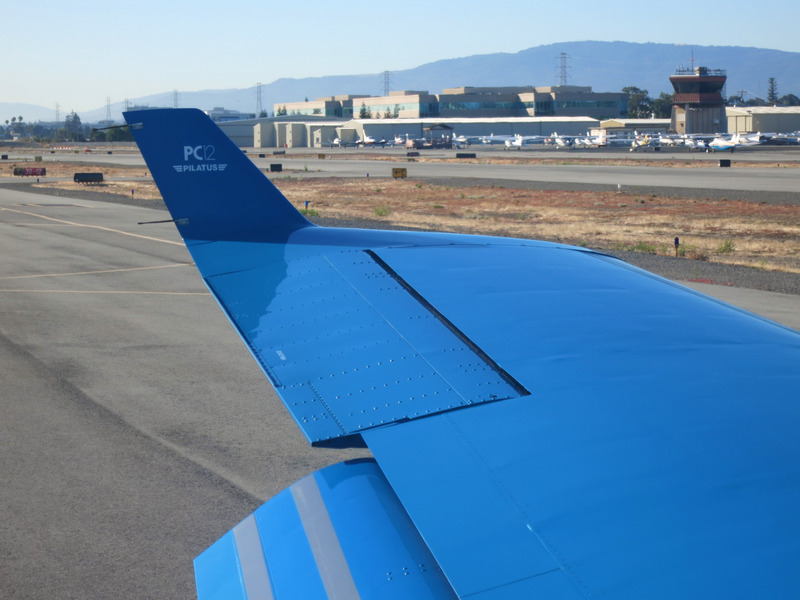 The winglets make the plane more fuel efficient. Taking off in Surf Air over the salt flats in San Francisco bay. 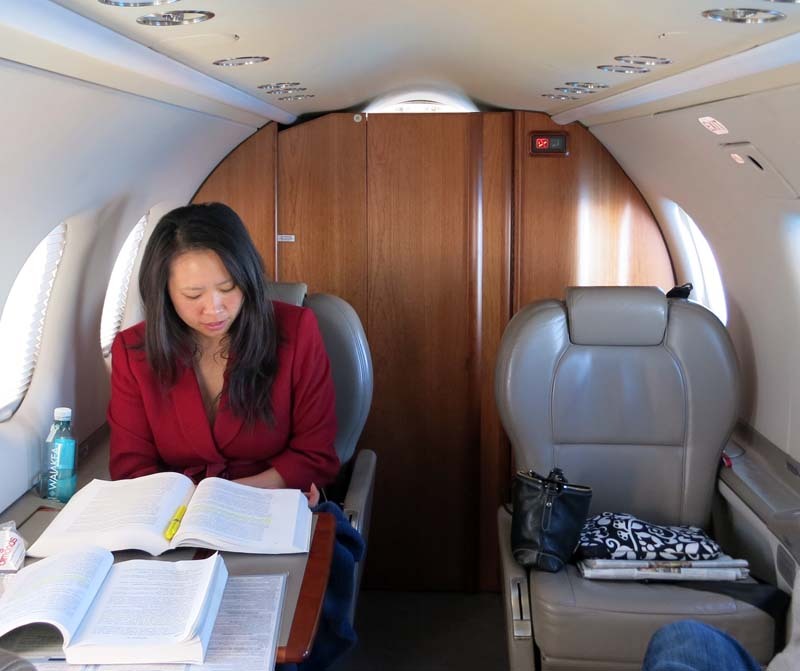 Katherine is about 5'6" tall, and below you can see that you can never stand up straight in a Pilatus PC-12 aircraft. 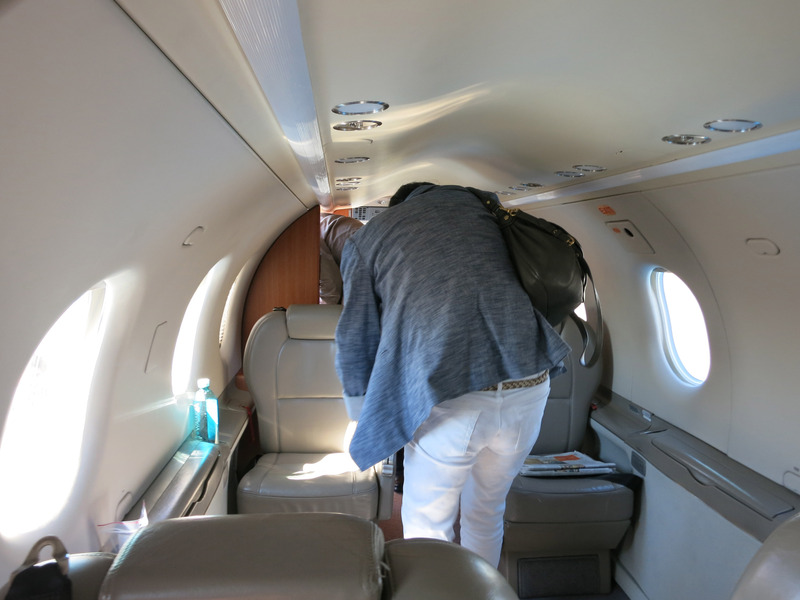 So for long flights where you might want to stand up and stretch, this is not as good as a 737. But as long as you are sitting, there is plenty of room. 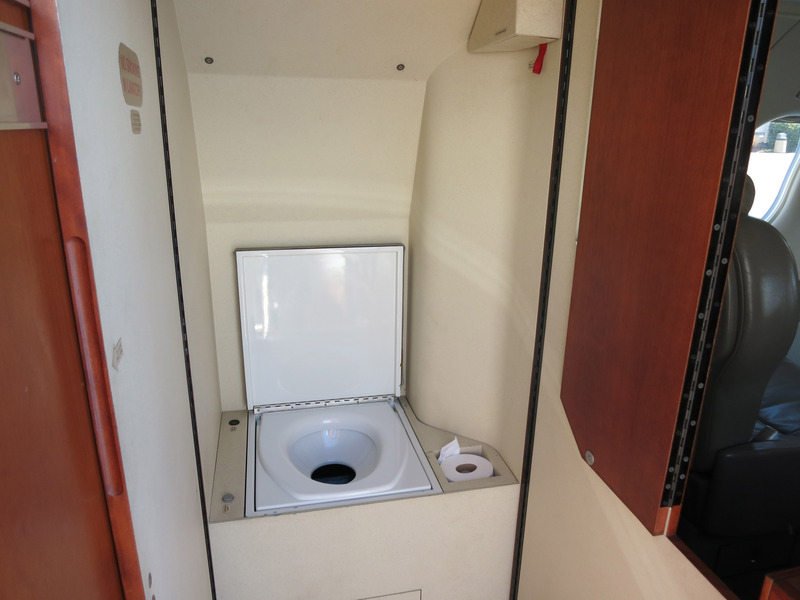 Below is a picture of the "emergency toilet" in use. 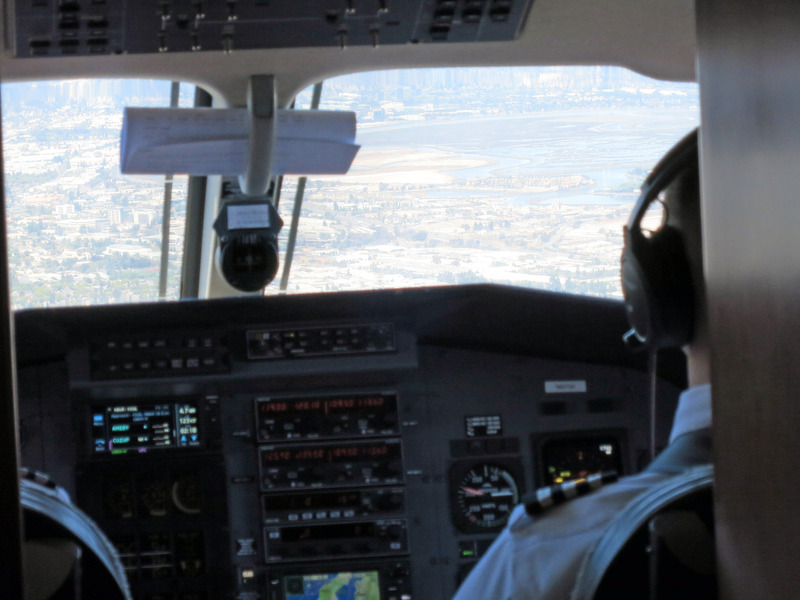 It is directly behind the pilots, and you unfold the wood grain panel doors to block the view of the pilots, and block the view of the passengers. Katherine *DID* use it, but said somebody big like me might not be able to fit. Below is a picture of the cockpit on the left, the toilet door in the middle, and the passenger cabin on the right. Below you see the toilet "assembled" - the cockpit view is now obscured and the last folding door on the right to the passenger area is still open (but can be totally closed soon). On one of the two wings is a black "radar enclosure". A close up of the radar enclosure on the Pilatus PC-12 airplane. Life is very good on Surf Air. 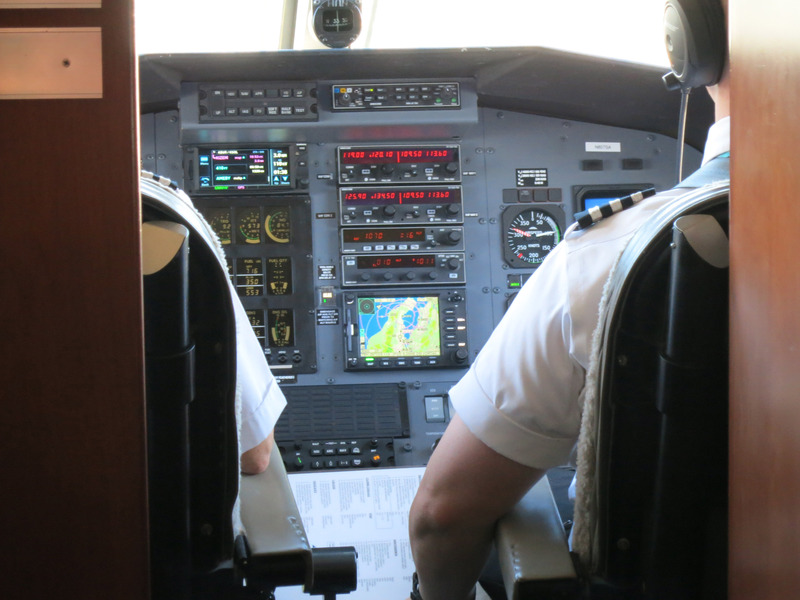 A zoom in shot of the cockpit and the Pilot's instruments on the Pilatus PC-12. 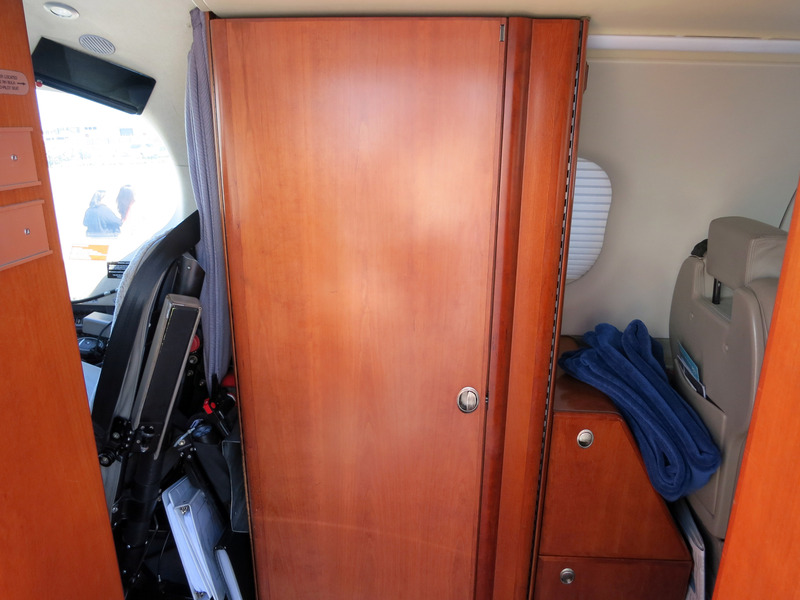 I think that is a Garmin G1000 system in there, but it's hard to tell for sure. Another picture of the cockpit. 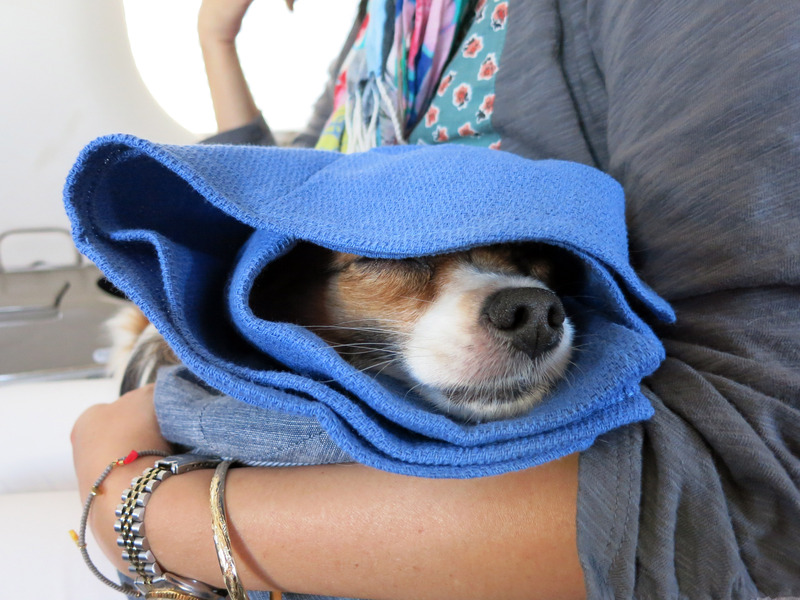 Chou Chou hyper ventilates and gets too excited, we cover his eyes with a blanket and he calms down a little. 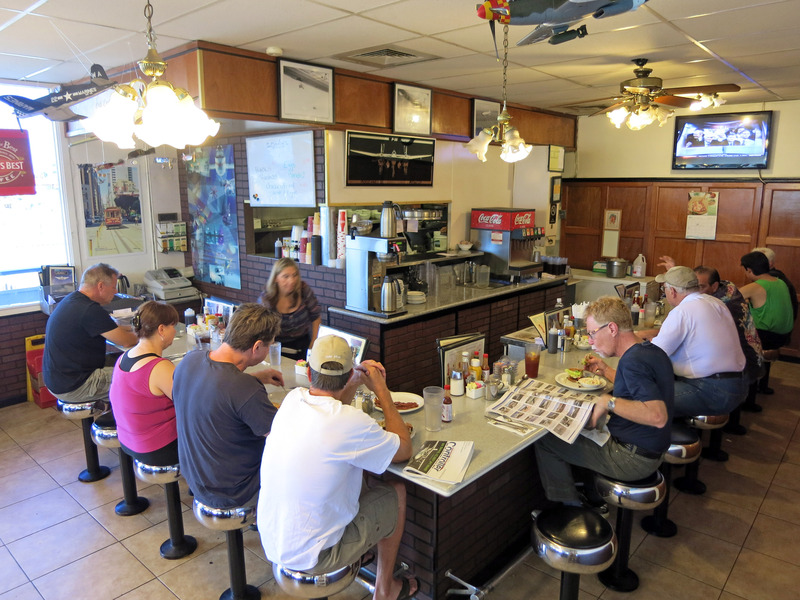 Another picture of the interior. On the ground in Burbank. Below is the private Burbank terminal run by "Atlantic" in Burbank California. Atlantic is a "Fixed Base Operator" (FBO). This is a VERY NICE terminal, extremely relaxed, only private planes and Surf Air use this terminal. 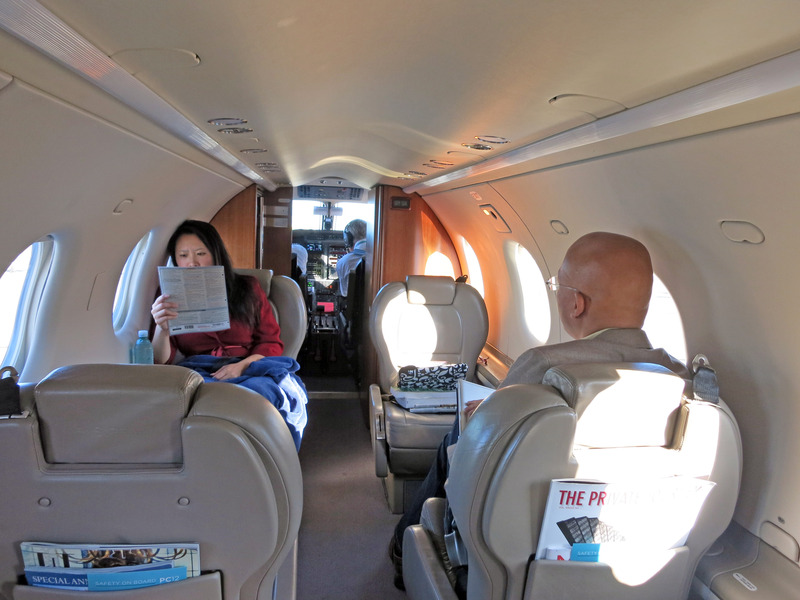 When I say "Private Planes" I mean mostly private jet planes, the kind that billionaires use. 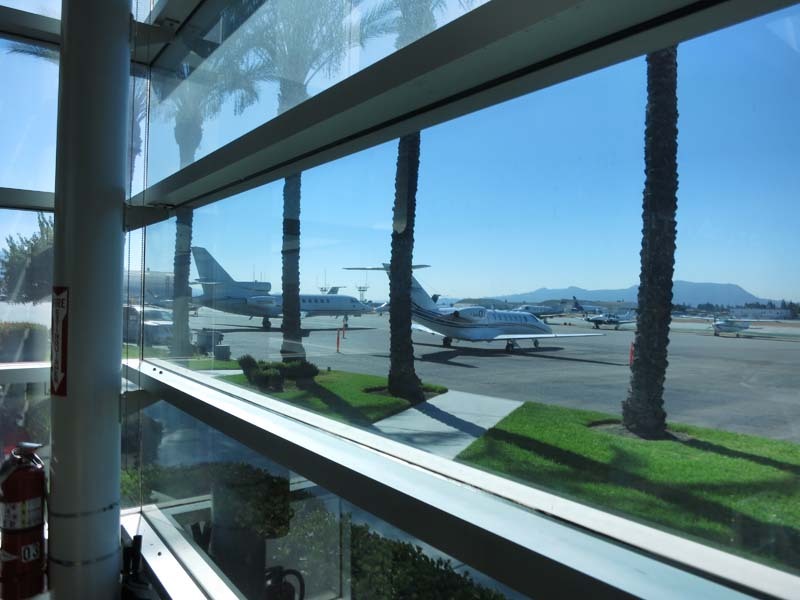 A quick note about the facilities: the bathroom below is in the private Burbank terminal. It is extremely clean and very pleasant. 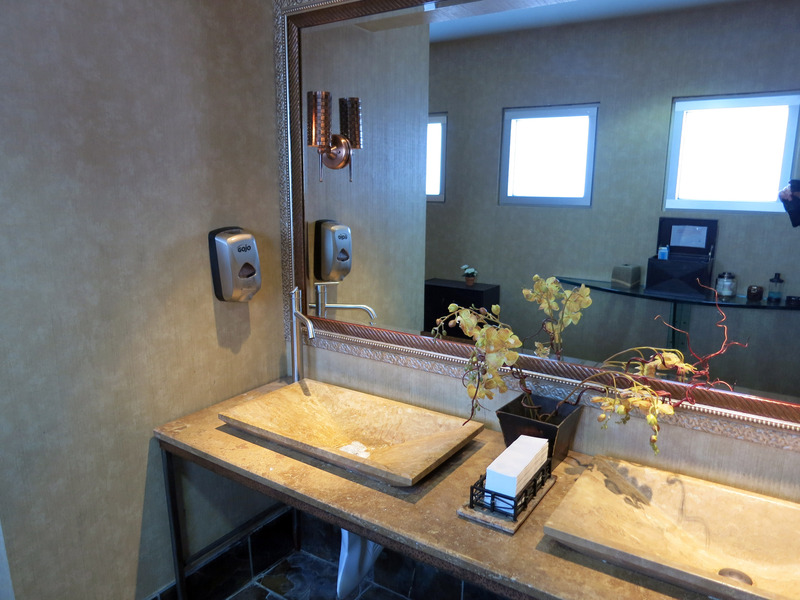 In the mirror you can see the opposite wall which has shaving cream and Q-tips and other little things. This is better and nicer than anything you can find in a large airport like San Francisco Airport (SFO). Chou Chou getting ready for our flight. 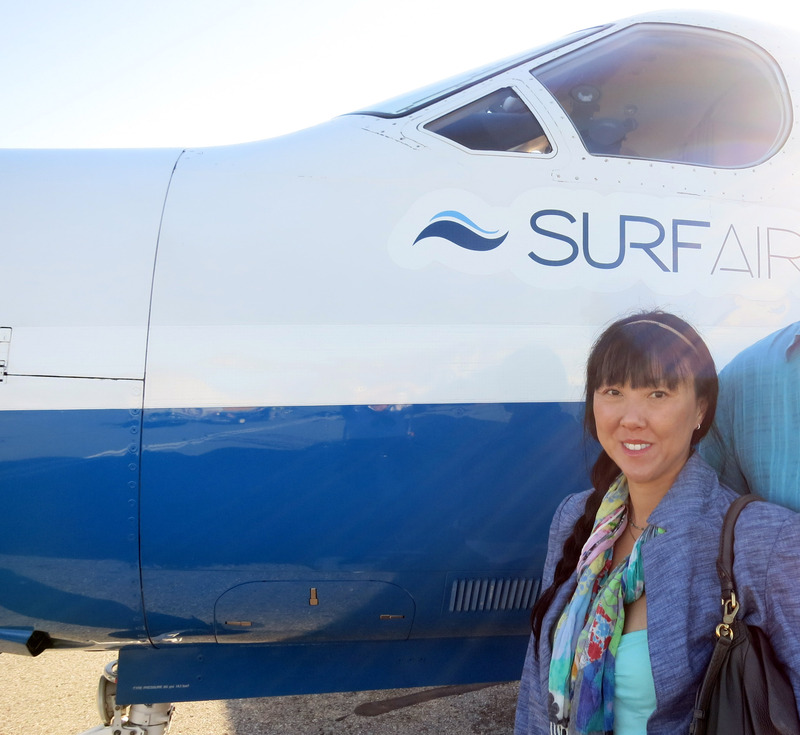 A quick picture of Chou Chou and Katherine for Surf Air, so they can recognize them on sight next time they come in. 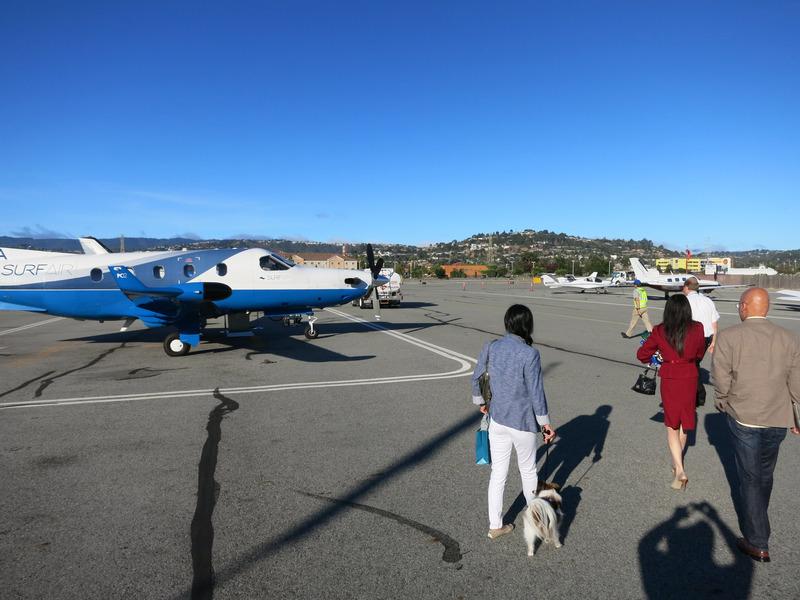 That's Marianna (Surf Air Concierge) taking Katherine and Chou Chou's picture. 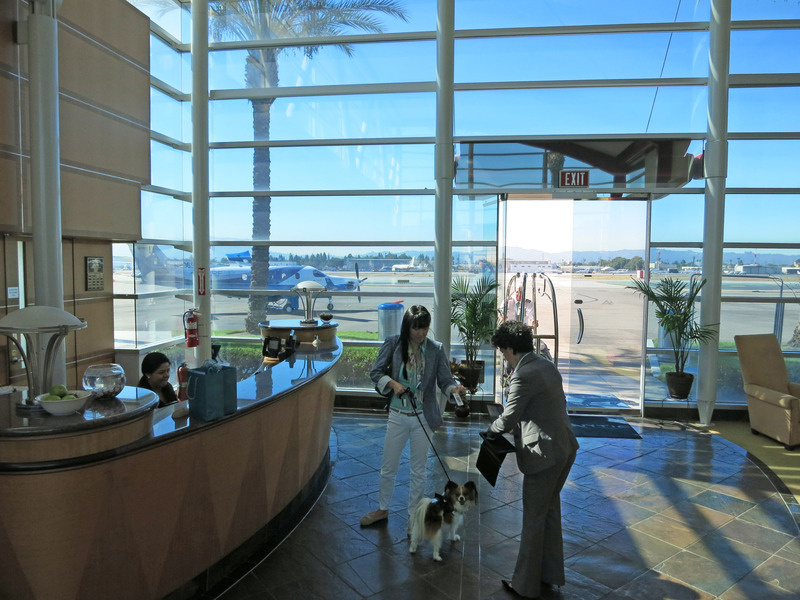 This is the front of the Burbank Terminal, and here is where we picked up and dropped off our rental car. 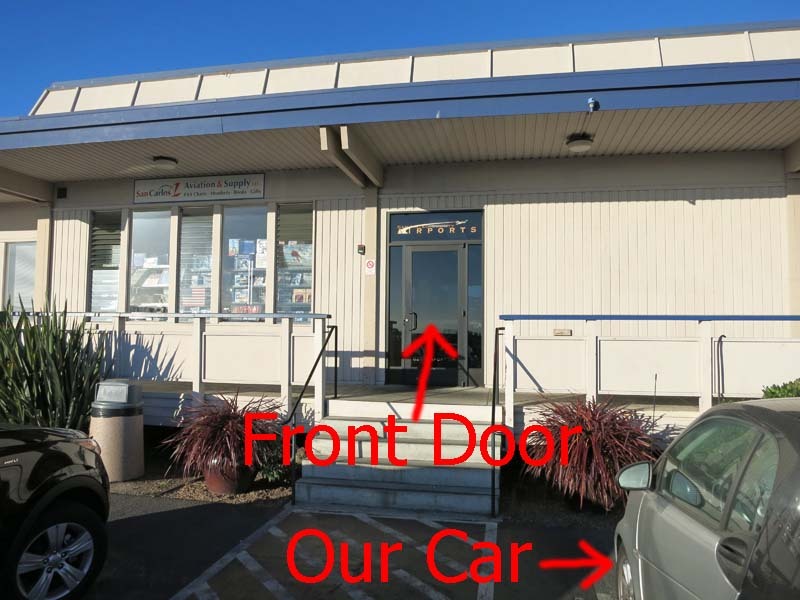 As you step off the Surf Air plane, they recognize you as somebody who rented a car FROM YOUR PICTURE and walk up to you and hand you the keys to your rental car, you get into your rental car and drive away. I've rented hundreds of rental cars, this was definitively the fastest, easiest, and most pleasant experience I've ever had. It is a Hertz rental car, but I think they would deliver several brands. 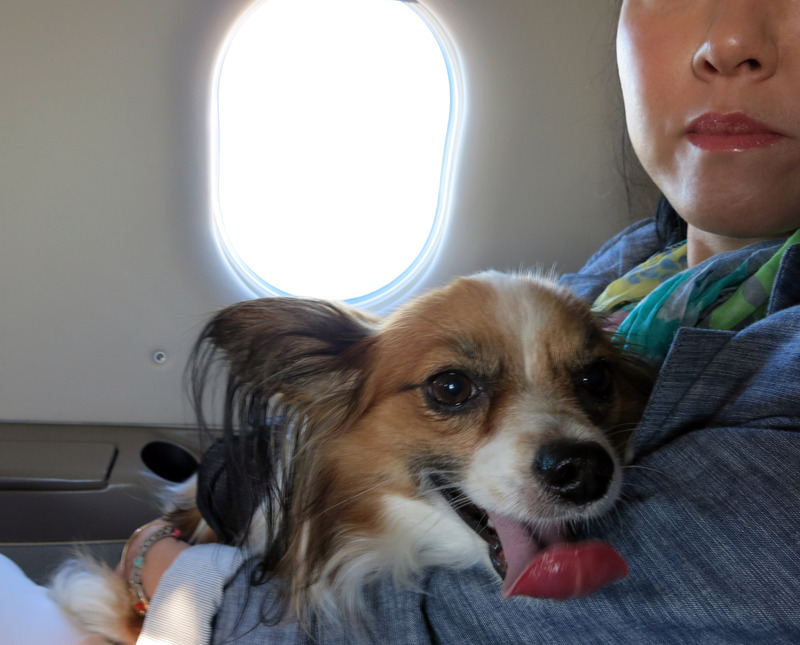 When we returned the next day to fly back home, here we are in Burbank again. From left to right the two planes below are a Dassault Falcon 50 and a Cessna Citation CJ3. 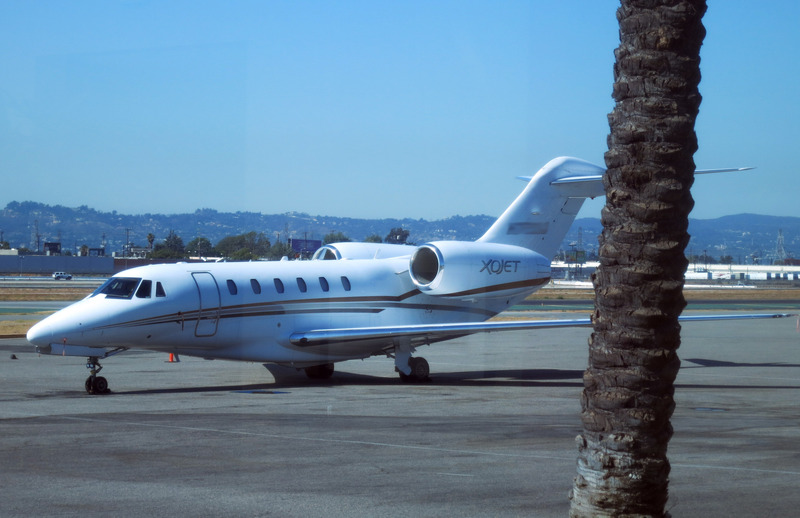 Looking out the other window, we see a Cessna Citation X (I think this is a model 750). 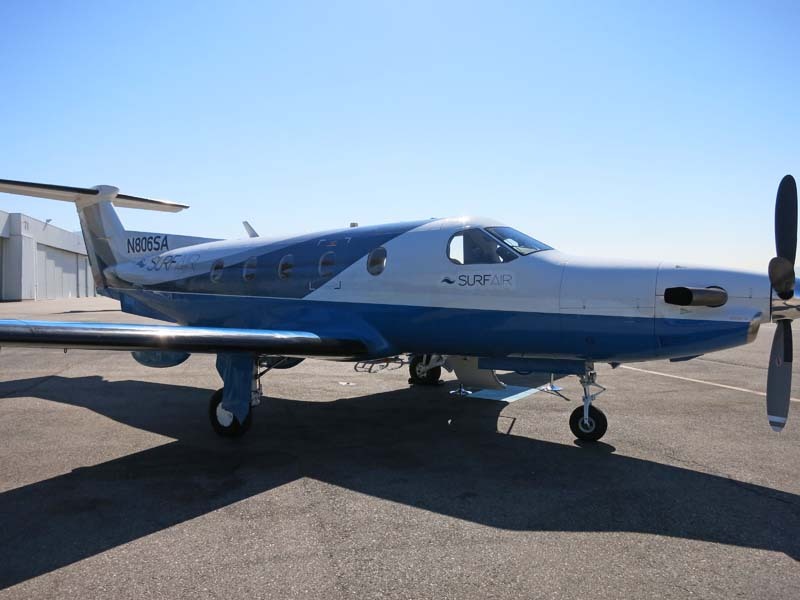 This particular private plane can fly at Mach 0.92 (almost breaking the speed of sound at 700 mph) and cruise at 604 mph and has a range of 3,700 miles. That's fast and long. 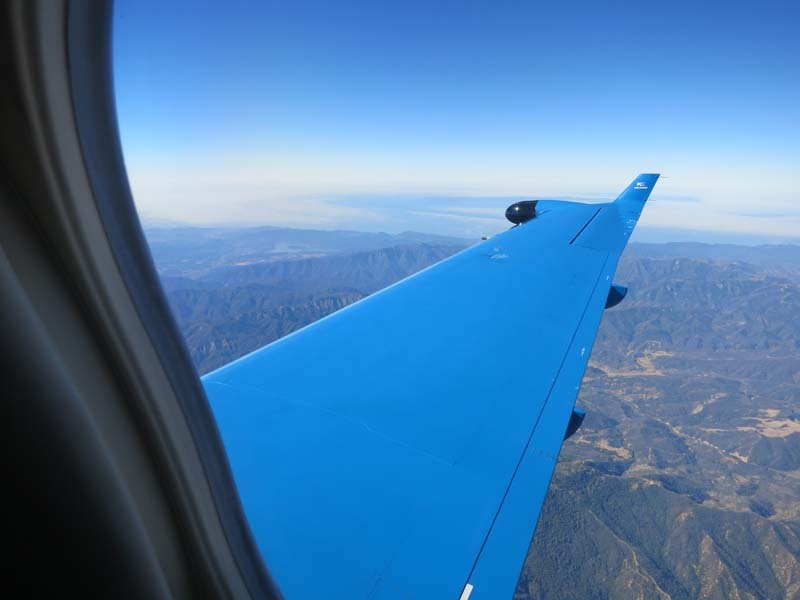 The distance from Los Angeles to New York is about 2,500 miles which this plane can do without refueling. Another angle of the Surf Air Pilatus PC-12. Close up on the Surf Air Pilatus PC-12 airplane. Chou Chou wrapped in his blanket to calm him down, he went to sleep so I took a picture. A picture showing the desk pulled out on my flight home, with my iPad on the desk. 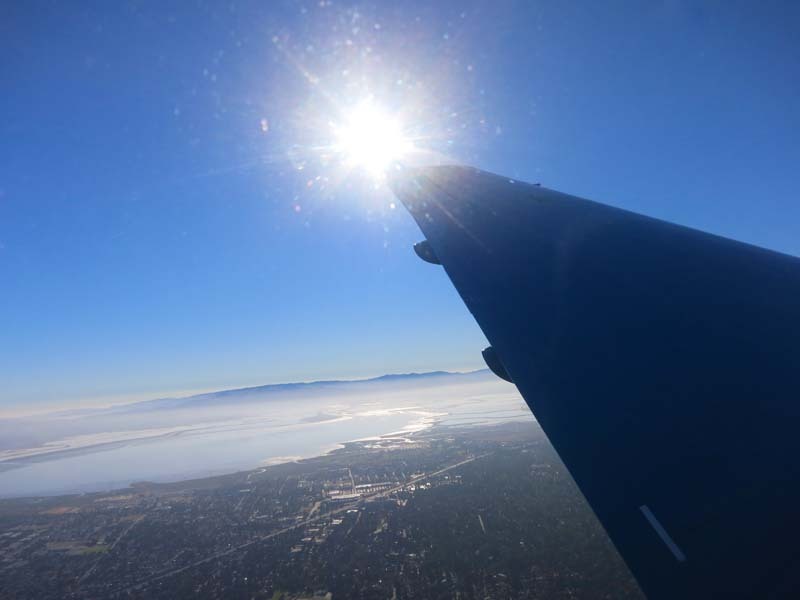 That might be Monterey below off our left wing as we fly home. 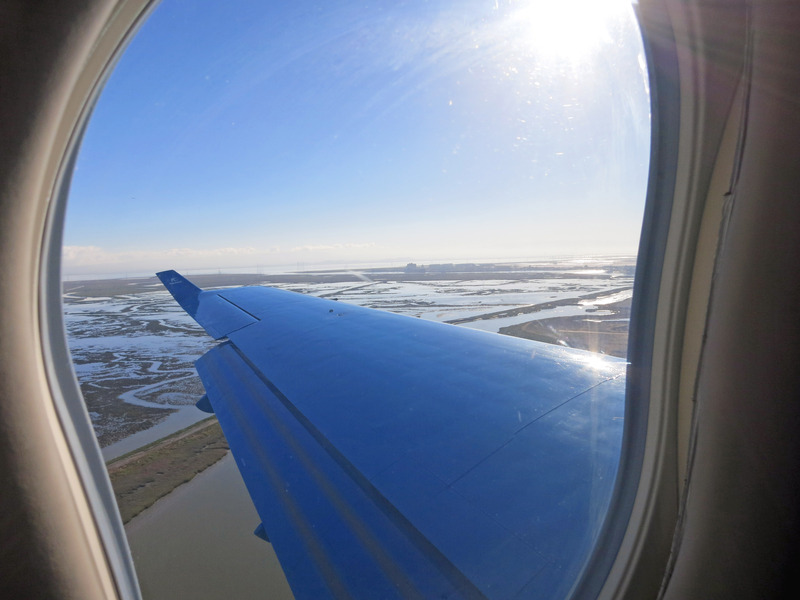 On approach to landing at San Carlos airport, a zoomed in picture showing what the pilots are seeing out the front window. A picture out our right side. The airport below is Moffet Field. Home again in San Carlos an hour and fifteen minutes after takeoff. Packing up our car, again, so close to the terminal. 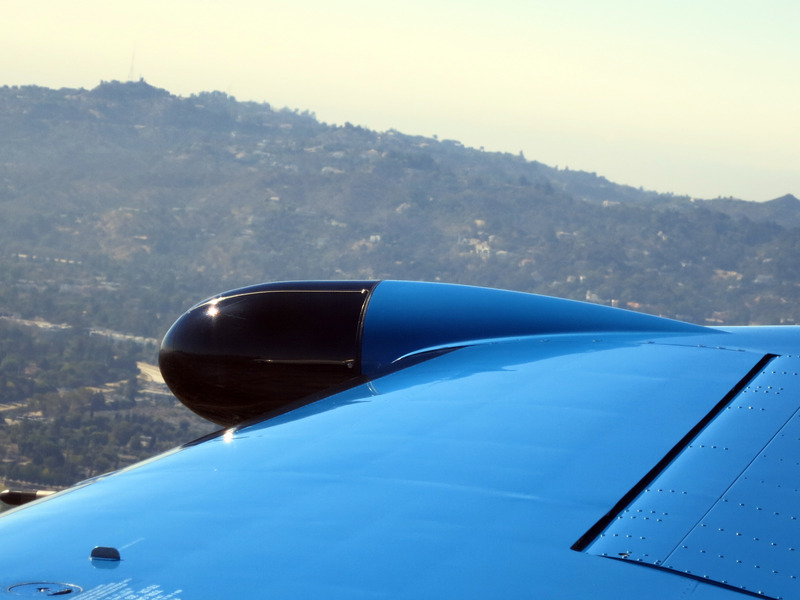 - Surf Air flies 8 flight legs every day to 3 destinations = 24 flight legs per day. For 30 days, this is 720 flight legs per month. 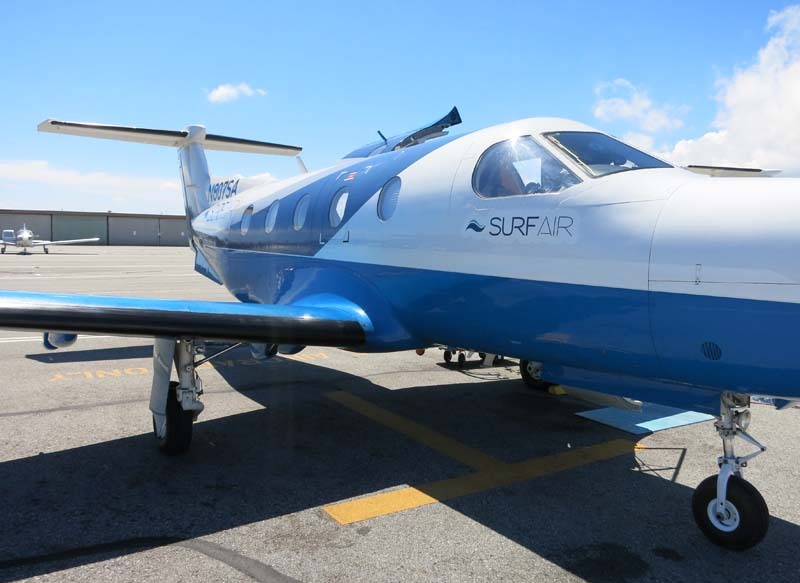 - Surf Air pulls in $600,000 / month right now ($7.2 million / year) based on 400 subscribers paying $1,500 / month. 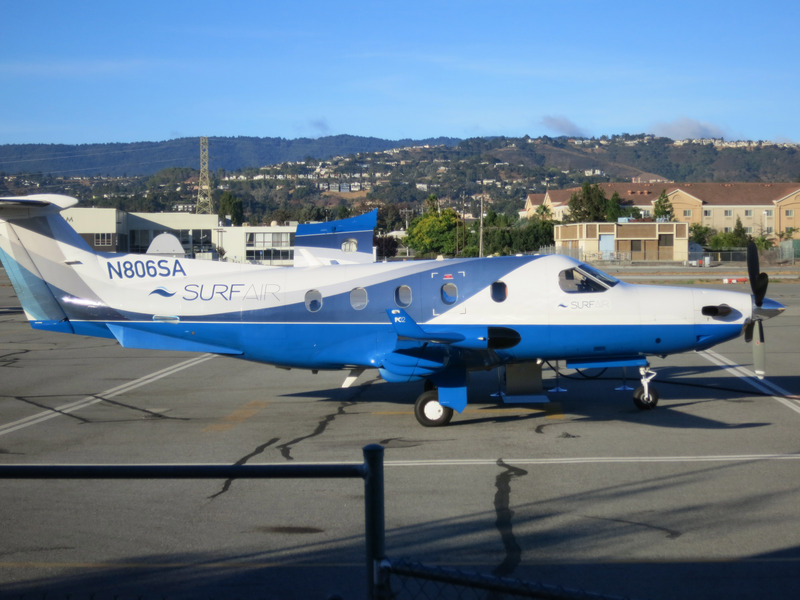 - Surf Air has 3 planes, each worth about $4 million. If they are financed on a 15 year loan at 8 percent interest, that is a monthly payment of $108,000. - If Surf Air gets 518 paying subscribers at the $1,600 / month price then they would break even and flights would be 2/3 full (4 out of 6 seats). 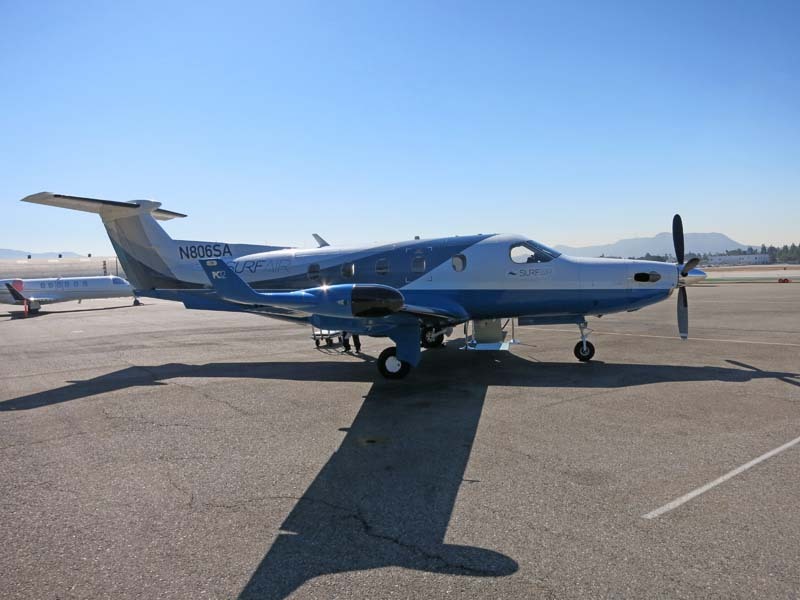 CONCLUSION - PER FLIGHT COST: if Surf Air wanted, they could sell individual flight legs (no subscription) for a "fair cost including profit" of about $200 per flight leg.